The virus & malware threat is no more a security problem with your system that affects your system and data privacy, but it has started affecting the personal lives of users. Despite putting all security measures in place, no Internet user is 100% secure from these various threats. The nefarious attempt to infecting your device with malicious content may lead to compromising your personal security and more. Thus, it is best practice you should leave no stone unturned when it comes to your system and data security. In addition to a few basic security measures, you should ensure that you have the best anti-malware program installed on your system. While the Internet is filled with these software & programs claiming the best, here we have rounded up 5 best antimalware tools for you that deliver highest results. Advanced System Protector: Advanced System Protector provides comprehensive security for your Windows system. Here, it helps you check system status, scan & find infections, and quarantine them for better security. Working on powerful scan engines it helps you scan and remove all infections even from the remotest corners of your device storage. It offers antispyware, antivirus, adware protection, and antimalware features for complete security. Comprehensive security from adware, spyware, viruses, and all malware threats. Regular automatic updates to keep you safe not only from existing threats but even from emerging malware threats as well. It works in the background and saves your scanning time. Highest cleaning ration where it cleans nearly 100% of detected threats. AVG Internet Security: AVG Internet Security not only secures your personal files but your private life too. It tracks & blocks malware threats in real-time to save you and your valuable data. It not only protects your data on internal storage, but it also secures your external drives and USB drives. It works on real-time analysis and Artificial Intelligence to provide you overall security against all malware threats. It offers advanced Ransomware Protection and Webcam Protection to provide overall security. Web & email protection to keep your online communication secured. Works in real-time to provide you complete security. Advanced payments protection and whole family protection for better results. Kaspersky Total Security: This cross-platform best antivirus for Windows works efficiently on Mac and Android devices as well. It offers tons of useful features to provide complete security & privacy to your system. It works on a simple & intuitive interface to keep your device security intact. This award-winning security tool protects you from multiple types of security threats in real-time. You can use this powerful tool to prevent others from intruding into your private life. It adds extra security when you perform sensitive tasks like online banking or shopping to keep you safe. It blocks inappropriate content & helps you manage the use of social networks to keep your kids safe online. It offers secure password manager to keep your important passwords and data safe. You can use its file backup & encryption features to make backup copies of valuable files. Norton Utilities Premium: Norton Utilities Premium offers abundant useful premium features to help users optimize system power, memory, and hard drive. It is useful when you launch high-demand apps for seamless user experience. It helps you clean up your PC and fix common computer problems that may slow down or crash your PC. By cleaning unnecessary files, you can also boost your system performance significantly. It helps you identify and remove unwanted startup programs to boost boot process. It offers file shredding features to help you dispose of sensitive data permanently. Its smart features help you protect your digital privacy by erasing your browser file downloads. Easy to use interface and 1-click optimization. McAfee Total Protection: Use McAfee Total Protection to stay protected from all latest & existing malware threats including ransomware, spyware, unwanted programs, and more. Using this powerful tool, you not only manage to protect your system and data security, but it also helps protect your private life. Multiplatform support including Windows, Mac, and Smartphone devices. Easy to use web-based account management for seamless user experience. 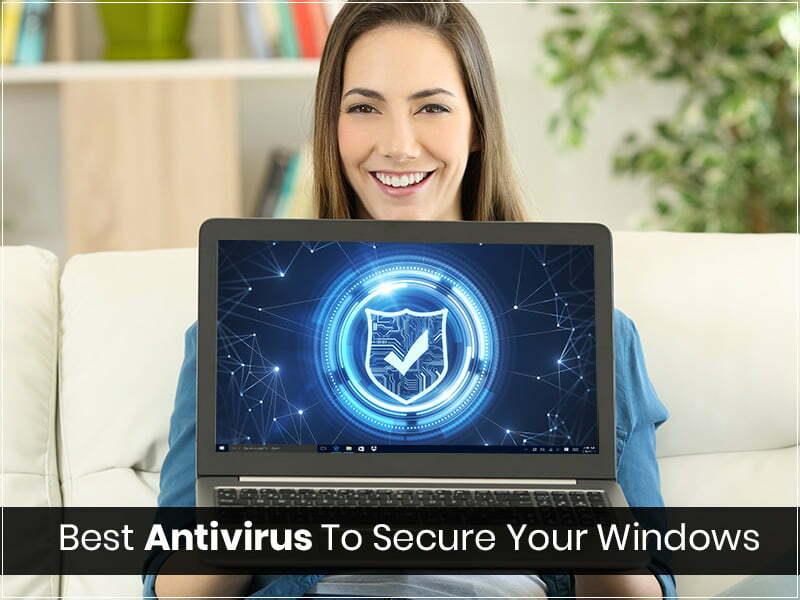 So, these are few simple yet powerful antivirus for windows and you can use to keep your system and data security intact. If you know more such advanced programs, then feel free to comment below.